Do you create videos for your fans and followers? Want to improve the quality? Today, Roberto Blake is with us to explore how quality videos are produced. 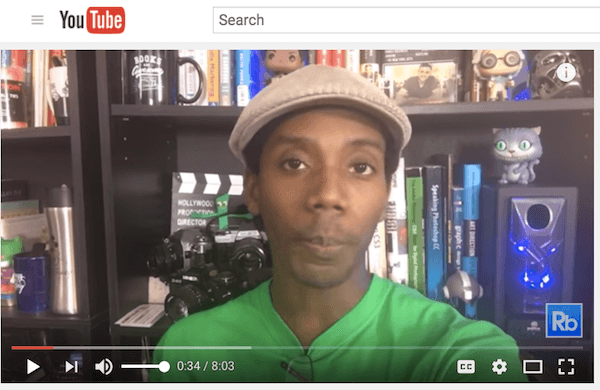 Roberto Blake, a visual and video marketing expert, has a popular YouTube channel where he teaches YouTube marketing and video editing. You can find out more at RobertoBlake.com. 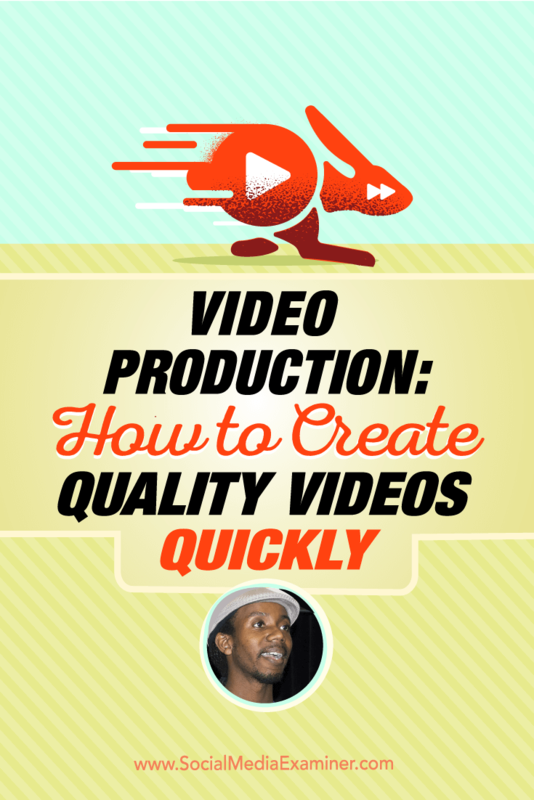 Roberto explores the ins and outs of producing quality videos. 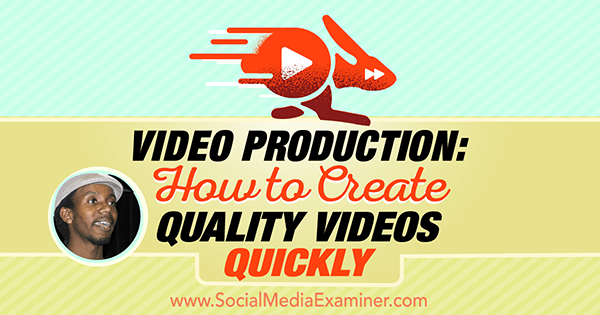 You’ll discover tools you need for video production. Listen as Roberto Blake shares what marketers need to know about video production, and how to create quality videos quickly. Like many kids, Roberto grew up watching Disney and was fascinated by all the behind-the-scenes information about the animators, storytellers, and moviemakers. He says animation wasn’t in the cards, so at about 14 or 15 years old he switched to video and was producing online video as a hobby for about six years before YouTube existed. Rob says he didn’t join the YouTube craze when it first launched, and shares that changed around the time he left corporate life for entrepreneurship.He’d already been running a blog to help creative professionals (designers, artists, web design), and found it was easier to answer questions and provide tutorials with video than it was to write and re-write the same email replies or blog comments over and over again. Roberto notes that if business people use video to address commonly expressed customer pain points, they’re essentially buying back some of their time; it makes things easier on everyone. How did Roberto decide to turn video into a business? He’d been making ad revenue on the blog side and wanted to scale his existing freelance business. As he focused more on teaching web and graphic design, rather than social media marketing, he decided producing video content was faster than organizing his thoughts around screen captures and stills. Plus, Roberto believes that, if he’s going to teach someone how to use Adobe Premiere Pro, a full-screen video tutorial like the one below is more helpful than still images and walls of text. Listen to the show to learn more about Roberto’s early experience working with a wedding videographer. Roberto explains that one of the easiest and most practical ways for people to learn is through video, because they can see a process. Even when the video isn’t based on a demonstration, like with software tutorials, there’s value in seeing another human being; reading that person’s micro-expressions and mannerisms can help cut the learning curve. Roberto remembers growing up watching Bob Ross, Reading Rainbow, and VideoSmarts, a program in the 1980s that helped children with memorization games, learning concepts, and reading. He notes that if individuals and businesses take advantage of educating via video, and make it engaging, fun, and informative, they’ll find their content resonates with people. Listen to the show to discover my personal connection to early training DVDs. Check the background before you start filming for context, continuity, and to make sure nothing is out of place. As a bonus, if the photo you take is good, you can use it as a thumbnail or promotional image in social media for the video. That way, you don’t need to seek out a usable frame from the footage. You also need to prepare the content, Roberto says, and notes that you may or may not need a script. For instance, if your video is marketing a product or service, you may want to have specific details in front of you. Alternately, you could read your notes beforehand and do the video cold, or memorize what you are going to say. You can always tape your notes or a script to the camera, have someone hold them for you, or use teleprompter software on your smartphone or tablet. Roberto says there’s a trick to using teleprompter tools, so learn how beforehand. Smartphone teleprompter apps include PromptSmart on iTunes and Teleprompter Pro on iTunes and Google Play. There are also teleprompter tools, such as the Glide Gear Adjustable iPad Smartphone Teleprompter and the ChargerCity tablet holder tripod. Most of the time, Roberto says he runs things cold. However, if he’s talking about a piece of software,he might read the specs off the packaging via audio recording, when he cuts to B-roll in post-production . He explains that while A-roll is the main footage of your interview, the B-roll is alternative footage to show something you are talking about. So, if you are discussing cameras and lights, you might do a cutaway to a picture of a Nikon or Canon camera. To inform the lights portion of your video, you can transition to a scene of you looking at lighting setups and rigs. Listen to the show to learn about the Social Media Examiner TV Show we used to do. Being uncomfortable is one of the biggest barriers to shooting video, aside from not knowing the terminology or having the gear, Roberto says. Because so many people feel uncomfortable on camera, he offers some of his own tricks. During recording, Roberto mentally superimposes an actual person in place of his cameras. If you can’t imagine your camera is a person, then pretend you are talking to your best friend, your favorite person, your crush, or your spouse. Whenever Roberto shoots (and edits) other subjects, he positions himself in their line of sight. And, if you don’t have an actual person, use a prop. There are a few tips to help you become comfortable in front of the camera. Often when Roberto makes a video, even though he is speaking in general terms and to the most people, he imagines he is talking to just one person (someone in the room who needs that information). In the same way, you need to communicate to the camera and emote the way you would as if you were talking to a human being; make that emotional connection. Roberto says what most people don’t realize is that a lot of the people he’s met on YouTube identify as introverts. They go on camera in their safe place (a home office, bedroom, living room, or in their yard), where they don’t experience judgment from others. They are allowed to make mistakes, because they can edit their video in post-production. That plays a role in projecting confidence. He notes that introverts might have an advantage with video because they feed off internalizing what they want to say and how they want to say it. They can perform for themselves, knowing other people will benefit. One way to improve the quality of your production is to do is multiple takes. While Roberto says he is a “one take Jake,” that doesn’t leave a lot of room for error. When doing intros and outros, it’s especially good to say it more than one way or more than once to give yourself coverage; that leaves you covered in case something was off in your mannerisms, timing, or pacing. Roberto also shares a trick for documenting your mistakes for when you edit later. If he knows he made a flub in recording, he will pause and then snap three times. Then, when he’s editing, he can identify the spot immediately, make a cut, and keep the good take. It makes the editing process much faster. Roberto is a big fan of having a consistent ritual for intros and outros. He’s heard that his audience likes doing the rituals with him. So, when he says, “helping you create something awesome today,” a lot of the members of his audience say it along with him. This sets you apart, makes you unique and thematic, and gives you continuity. Listen to the show to discover my tips for video production. For beginners, especially if you are using your smartphone, there’s a lot of great free editing tools. Most of the smartphone apps are free or $5. Roberto is a fan of Adobe Premiere Clip, which is simple to use. All you need is a free Adobe account, which you can sign up for via email. It can upload video directly to YouTube and Facebook for you. It also has color grading filters, lets you loop background audio (they have a few tracks which are royalty free), mix down the audio, edit clips together, cut things out, and more. 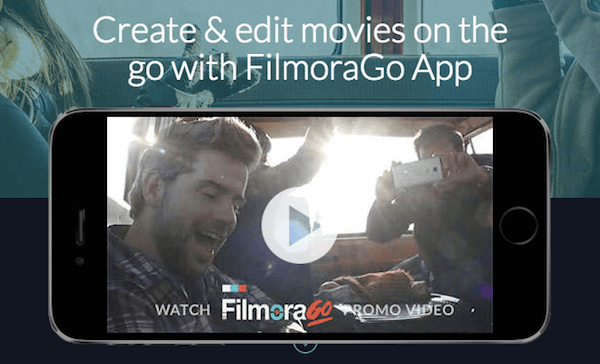 FilmoraGo is a free video editing app that works on iPhone and Android. Filming from a smartphone is convenient, especially when you travel; this is often how Roberto does video when he travels, rather than setting up his camera. Roberto has seen phones produce amazing video content with great quality. Today’s phones are more powerful than the computers that got us to the moon, and they are better than the cameras Spike Lee had when he shot Do the Right Thing in the 1980s, he adds. Editing on an iPad is a lot more powerful and you can be more precise, because you have a larger screen to work with. When you want to start adding things like B-roll, doing more with your audio tracks, animating intros and outros, insert lower thirds and motion graphics, then you need more professional software. However, you can still do similar things on desktop that are not quite as sophisticated, and do it affordably. Free video editing programs such as HitFilm 4, DaVinci Resolve, iMovie, and the Windows MovieMaker legacy version are great, he adds. Though limited, they are powerful and you can do great looking videos. If you want something affordable that’s more sophisticated, Roberto recommends tools like Camtasia for screen recording (you can do free screen recording with OBS), apps like Adobe Premiere Elements, which is a scaled down version of Premiere Pro ($75 to own it outright), and Corel Video Editors Suite for $100. If you’re wondering if you should film in UltraHD, Roberto says for the average person, business, or marketer right now, it doesn’t make sense to record that way. 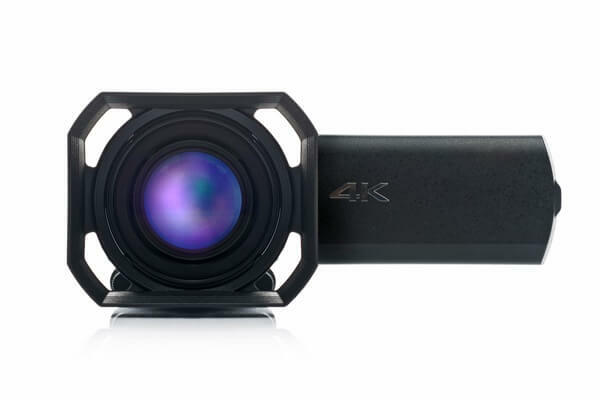 However, UltraHD offers creative options to those doing advanced video. For instance after you record something in super-wide in 4K, you can zoom in for material to use later. Listen to the show to learn more about shooting video in 4K..
Prisma is easy and intuitive to use. There are a bunch of artistic filters so you can make your photos come across as brush strokes, like it’s hand drawn, Van Gogh or Picasso style, and more. It’s a great way to transform your profile pic into an artistic rendering of yourself. When you publish your image, there’s a Prisma square in the bottom righthand corner. However, you can turn that off. Experiment with your marketing images by adding other artistic elements to them. For instance, we took our logo, Scout, and tried different filters. Also, if you’re doing advertising, this is a cool way to dress up some of your images, and make them stand out. Listen to the show to learn more and let us know how Prisma works for you. If you are looking for more professional development for video, check of the sessions on video at the Social Media Success Summit. I will be doing the opening keynote on How to Use Video and Live Video to Promote and Sell. In addition, Amy Schmittauer is going to talk about How to Use Video Storytelling to Fascinate Your Viewers, Tim Schmoyer will share How to Engage Your Audience With YouTube Live, and Roberto Blake will discuss YouTube SEO: What Marketers Need to Know to Succeed. Plus, Derral Eves will cover Harnessing the Power of YouTube Ads, Steve Dotto will share How to Start and Grow a YouTube Channel, and we’ll have at least three or four other sessions on Live video. Video is just a small component of what we cover at the summit. 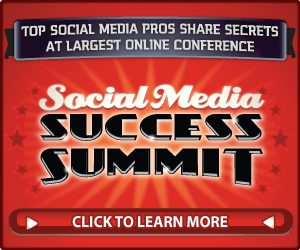 Visit SMSS16.com, look at the agenda, click register, and then get ready for an amazing ride, as you take your social media marketing to an entirely new level. Learn more about Roberto on his website. Watch the videos on Roberto’s YouTube Channel, including ones on how to use Adobe Premiere Pro, basic editing, and adding music. Follow @RobertoBlake on Twitter and reach out if you have questions. Learn more about HTML, search engines Excite, Lycos, and Yahoo, and peer-to-peer sharing. Check out Bob Ross (The Joy of Painting), Reading Rainbow, and VideoSmarts. Listen to the podcast on how to create video with a smartphone with Justin Brown. Take a look at smartphone teleprompter apps PromptSmart (on iTunes) and Teleprompter Pro on iTunes and Google Play. Explore teleprompter tools, such as the Glide Gear Adjustable iPad Smartphone Teleprompter and the ChargerCity tablet holder tripod. Read about A-roll and B-roll footage. Learn more about smartphone apps Adobe Premiere Clip, iMovie, FilmoraGo, and CyberLink Power Director. Check out Do the Right Thing and watch the trailer. Explore free video editing programs HitFilm 4, DaVinci Resolve, iMovie, and Windows MovieMaker. Learn more about Camtasia and OBS for screen recording. Take a look at Adobe Premiere Elements and Premiere Pro, as well as Corel Video Editors Suite. Check out Prisma on iTunes and Google Play. What do you think? What are your thoughts on video production? Please leave your comments below. Roberto Blake talks with Michael Stelzner about video production and how to quickly create quality videos.